Today Mobilunity is inviting you into an existing world of Android. We will walk you through the definition of Android application development, important numbers that define the current market, as well as explain how the type of application defines the choice of Android app development software and vice versa. In simple terms, it is the practice of creating a new application for devices that are running on the Android operating system. Google says ‘Android apps can be written using Kotlin, Java, and C++ languages’ using the Android SDK, while the use of other languages, frameworks and technologies is encouraged. We have seen the operation system emerge and die, however, it seems like Android is here to stay. According to the research, Android holds 88% of the global mobile market. However, closer to 2019, the overall worldwide share reached 75% of the global market share. And with Android, we are talking billions of devices! No wonder that Android application development is on the rise now. Since 2009, the number of applications available has grown significantly. Surpassing 1 million marks in July 2013, Play Market now has approximately 2.6 million applications available. What Applications Dominate Android Mobile App Development? According to Statista.com, most popular categories by the reach are tools, communication apps, photo/video editing, travel, productivity, and music apps. However, judging from the number of downloads, game development is leading the market. No wonder so many companies make the decision to create an Android app for their business. Continue reading to learn more about types of applications available, popularity and demand for Android developers, tech stack, as well as onshore and offshore Android application development. How to Choose Android Development Company? If one is looking for Android app development company to work with, they should be aware of the process and certain things that need to clear up before rushing into the final decision. While there are very little to none companies that focus on delivering Android application development services, the choice typically falls on a broader range of services, i.e. mobile app development. And, if one is not going to hire an in-house team, here is what they should know about a vendor they choose to be their Android mobile app development company. First and foremost, you need to learn the basics. This includes name, type of the company, their location, and type of services rendered. It might be tempting to choose the company with the lowest price, however, the chances are that the quality of the final product can be compromised. So-called ‘boutique companies’ are often small-to-medium size teams that provide personalized assistance to every client and can offer both a unique perspective and an uncommon solution to a client. On the contrary, enterprise-level solutions can be created by companies with relevant experience and enough human force to cover all the grounds. Typically, such solutions are more rational, rather than emotional or personalized. In the nutshell, a hybrid app can cover multiple operating systems, however, providing less functionality. Native apps offer more operating capabilities, but their development is expensive and comes with lots of nuances. Why Understanding the Location Options Matters for Choosing the Right Android App Development Company? As might be obvious from the names, this classification relies on the geographical proximity of the business and their development vendor. Onshoring means that Android company is located in the same country as your business. This is the most expensive option as rates for development are typically high for most countries that are interested in Android app development services. Though, it definitely has some benefits like the same culture, language and time zone. Nearshoring refers to outstaffing to a country that has either common border or lies in the close proximity to the original location of your business. It is a good option for countries that have similar legislation and currency. Most popular now is offshoring that means working with an Android development company that is located further away. Despite certain inconveniences (e.g. time zones), such companies can offer multiple perks, such as lower cost of development and access to a wider pool of experts to choose from. Among typical offshoring destinations for the United States are countries of Eastern European countries, such as Ukraine or Bulgaria, or India. Do you know the saying that paper never blushes? Regardless of how good the company sounds to be in their ‘About Us’ section, any business owner needs to think clearly before making any decisions. If you believe you have found your perfect company, look for the examples of their work and read the reviews from their clients. It is important to understand whether the chosen company shares your vision and beliefs, as it can benefit the process in numerous ways. Once the company has been chosen, you need to send an inquiry and engage in the ‘discovery’ stage. Typically, this stage is required before development to clarify the requirements, conduct market research, prepare an offer on schedule, analyze and interpret fundamental needs, etc. The discovery stage is often treated as a probation period. If, after this time, you are still satisfied with the company’s approach, price, and communication, it will be easier to commit to them. Android app development is an intricate process, with so numerous aspects and a long list of things to be accounted for. It’s safer to spend time finding a great partner, that loose tome and resources falling for the first one out there. Android development services can be a key to the success of the company, so be careful. Want to hire Android developers? 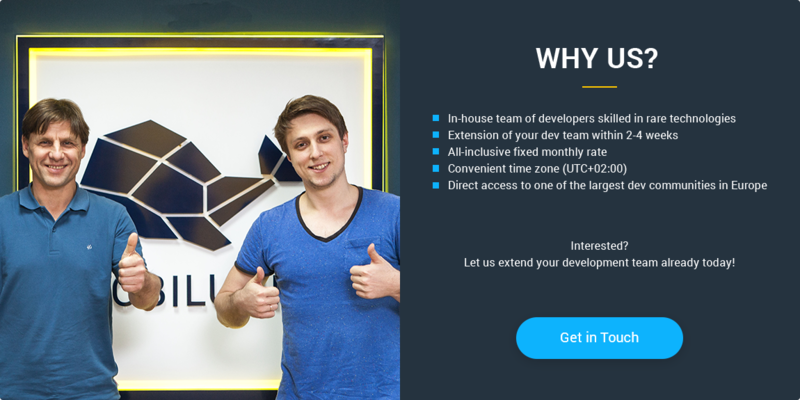 Create the high-quality Ukrainian Development Team with Mobilunity! Great Android Web Developer: Who Is He/She? There are over 12 million mobile developers worldwide, with an estimated 6 million targeting Android development only. Let’s have a look at the countries that employ more Android developers than others. Android developers are most demanded in the USA, that account for 21% of Android developers, followed by 5-6% in India, Germany, and the UK. Current Android developer demand can be best described by over 7,000 positions available on Indeed.com only for the US market. European market requires additional 5,000 people to fulfill all open positions. With the growing popularity of mobile technologies, the need for developers who can produce high-quality Android will only grow. So what defines a good Android developer? Building an application is not as easy as it may seem. One needs to have technical skills, clearly understand the business objective and points of monetization, as well as be able to come up with the most suitable solution. With Android, the opportunities are numerous, so here is a list of skills that can help Android web developer become an expert and offer excellent services to the clients. Knowledge of Java. And Kotlin. At least basic knowledge will help you understand the logic behind Android itself. Plus, some of the top Android developers are those who can offer complex solutions (e.g. creating an application for existing Java back-end). Understanding of XML. In Android, XML is used to creates layouts that as a foundation for UI. Android SDK. A set of pre-packed code that improves and speeds up the development process is believed to be a must-have for Android app development. Android Studio. One of the several IDEs for Android development, this one provides support for most common Android SDKs. APIs. App development requires interaction with numerous third-party services, so hands-on experience with APIs is a must for best Android developers. Databases. Working with various back-end systems, a good Android developer needs to possess knowledge on how their app will be connected to the server side. Material design. Knowledge of these guidelines is important for projects, where design services are not planned or accounted for. Understanding of SDLC and business processes. The better a developer can understand the logic behind the business decision, the better they can account for important features of the app, plan the process and deliver the expected result. An era of ugly, single-function apps is far behind. So is a medium-to-large size application with complex design solution is requested, that is not a job for a single human being. Moreover, on various stages of development, the team composition will change. This structure will help create a skeleton for further development, articulate requirements clearly and set the ground for the success of an Android app. Once the project is up and running, and funds allow further innovation, the team structure will evolve. UI/UX designer to improve the overall experience of using an app. BA to introduce market research results, as well as validate customers’ feedback. Developers (senior staff can work on innovation, whereas others provide support for a running application). QA assistance with Unit Testing, Load Testing, Usability Testing, etc. to ensure the scalability runs smoothly. Looking for Android App Developer: Hire, Outstaffing or Freelance? Trust a freelance Android app developer. The overall process of looking for Android app developer can be daunting, especially is the company has little to none experience with hiring tech personnel. We will discuss the pros and cons of all options and offer some advice for the process. Many business entities believe that the best work can be done under their roof only. What are the advantages of hiring an in-house expert or even a whole team? Source code rights belong to the company. Most contracts state clearly that all the code produced belongs to the company. Complete control over every sage and step of the process. Ability to change, modify or elevate requirements during the process. Flexibility in terms of time/manpower ratio. For projects with tight deadlines, there’s always an opportunity to hire more people. Security. Typically, along with the signing contract, most employees are asked to sign NDA protecting the company interests. Free choice of tech stack upon the interests and objectives of the business. The pretty picture above can be clouded by some drawbacks, that come with permanent employment. Lack of experience and expertise from a long-term perspective. Technology changes and evolves constantly, so in-house teams tend to have hard times keeping up (unless the company invests in their training, which brings us to the previous point). Time-consuming for CTO or related personnel. The need for direct supervision comes with a cost: one needs to communicate and control every step, working with different teams and spend much time making things work according to the schedule. Development is only the first part of the process. Unless you plan to scale up and add numerous features, hiring a whole team means you will have to let some of the go, once the app is ready, as maintenance does not require much effort. Extra expenses for testing devices for multiple platforms. In some cases, hiring in-house teams is the only option. Some domains, such as banking, insurance or government sector forbid companies from outstaff the services to third parties. Often companies who have a tight budget and are desperate to find Android programmer, refer to freelance to look for cheap Android app developer. Typically, freelance developers are self-employed and offer development services via various platforms. Let’s take a closer look at what makes such services appealing to the clients. Lower cost of services compared to in-house expert. The company does not have to pay for a work station, rent or vacation of such developer. Wide availability. One can easily find an expert with expertise level needed on one of the above-mentioned platforms. Less paperwork required. Typically, freelance services require less paperwork in terms of agreements, contracts, etc. While the costs are low, traditionally freelance services come with numerous pitfalls that you need to be aware of. Lack of communication. Typically, you will either communicate via messaging system or skype and such calls may limit the timeframe of communication (especially for different time zones) or delays. Risks of information leakage. Most freelancers do not sign non-disclosure agreements and chances of someone copying your idea might be high. Plus, it is hard to control how sensitive data or personal information might be handled. Limited expertise. In the case with an in-house team or outstaff, the whole process is covered, whereas freelancer usually specializes in narrow tasks. Delivery complication. Typically, freelance is a one-man team, so being stuck or getting sick can cause major changes in schedule, thus shifting the delivery and/or official release. Lack of commitment to the project. As they are self-employed, freelancers will always be on the lookout for a more interesting or profitable job. They won’t have your company’s interests at heart, meaning it might compromise the quality or integrity of the final product. Reduced legal obligations. Reduced paperwork has an ugly underbelly of limited legal accountability. And we aren’t talking about the financial aspect, but rather time you might lose if the quality of the services is not up to your standards. As you might see, freelance has more drawbacks than benefits, meaning the risks can outweigh the benefits on so many levels. One can only wonder whether there is any way to get a decent Android app and not spend a fortune on it. Well, the mid-way compromise would be the outstaffing of Android app development. Let us tell you more about it. Usually, a company begins looking for Android app developer when they have created an infrastructure behind the service and need Android app developer to create an application that will help their clients receive those services. Offshoring (traditionally, affiliated with the US outstaffing to Europe or Asia). Nearshoring (typically associated with Eastern Europe outstaffing Android development to Western Europe due to the costs). Multisourcing (Hiring dedicated teams in regions on countries where an app will be used, usually used by corporations whose services might differ based on location). Interested to get the team for your project? Find high-quality development services with Mobilunity! Apart from the financial factor which we will discuss later on, outstaffing has numerous other benefits to offer. Access to a worldwide pool of experts. Not being restrained by the limitation of local recruitment, one can find the best fitting expert with both skills and experience in the required field. Any team composition or level of expertise required with the best use of their abilities (as your senior Android developer won’t have to deal with simple tasks, as a junior Android developer won’t have to spend weeks trying to come with a solution that is beyond their pay grade). Ability to outstaff the whole process. Modern outstaffing companies offer the full cycle of development services, from research, prototyping, development, to testing and further support. Shorter termination period. Under the USA regulation, the notice of termination of the contract should be sent 30 days prior with no further penalties. Try terminating the contract with an in-house team member with no further payments. No need to invest in infrastructure or worry about additional expenses. Better security and protection. As you are signing a contract with a company-provider, they are obliged to adhere to your requirements and you don’t have to worry about any issues. Strict acceptance criteria, thus better quality. The team will be interested in the high quality of the code, as they will have to pass the acceptance stage. All these benefits allow companies to focus on their business rather than worry about tech eams. However, there are certain things that people consider the disadvantages of outstaffing. If someone is looking for an Android developer, they should have a look at this information. We’ve gathered the most prominent factors that define the final decision when it comes to hiring a developer or even a team for the project. Let’s be honest, apart from the fact that company needs to choose their service provider carefully and might need to provide them with specific devices for testing, outstaffing seems like the best idea for so many reasons. If you want to learn more about rates and compensation, please scroll down to the corresponding section to learn whether freelance is indeed that cheap, what rates for Android services are dominating the market and what countries are considered the most expensive in Android development. How to Hire Android Developer? So in order to hire Android developer, one needs to clearly understand the requirements for the project, as well as what type of work this particular developer will have to deal with. Task: What type of application and in what volume should this developer do? Results: What deliverable do you need? Should this be a prototype or a running app deployed to Play Market? Targets: What are the deadlines for this project? Will the process be broken down into certain phases? Time: What is the start and what is a submit-by goal date? Compensation: How much money can a company spend on this app? Choose candidates based on both knowledge and experience. The best decision is to look for a developer who has experience in a specific field or has worked with a similar type of applications. Conduct interviews with a technical expert. If there is no personnel available in your company, it might be a good idea to invest in technical consulting to find a fitting developer. Agree on a trial period. Sometimes, people just don’t click. If you plan to revert to freelancing, make sure to discuss trial period within which the cooperation can be terminated. So here is our advice on how to hire Android programmer and not regret your decision in the future. What Is the Real Android Developer Cost? So, every company is concerned with the cost of development and the Android developer price they will have to pay. For this comparison, we have examined PayScale and ItJobsWatch for the average Android developer rate. As you can see, the US and Switzerland are the most expensive countries when it comes to Android app development cost. They are followed by the United Kingdom with just a slightly smaller rate. When it comes to hourly payments, US developers have $30.29, while Canada pays moderately $21.00, whereas Android developer hourly rate in the UK can reach £46.00. Some people think that freelance is a great alternative that allows a company to save sufficient amounts of development. 1000+ hours billed (meaning this person has experience with at least 2 to 3 apps). Okay, does this seem cost-efficient or at least reasonable? Yes, the company can save on rent or healthcare, but with all the drawback freelance has, this solution does not seem smart at all. It’s high time to look at outstaffing. Let’s be honest, this makes so much more sense in terms of cost-efficiency. With an annual rate that begins around $25,000, Ukraine can offer Android development services that are 1.5 to 3 times cheaper than in North America or Europe. Plus, Android outsstaffing company will take care of all the additional costs, so there will be very little to none extra expenses. 500-700 hours for basic application with simple functionality and basic design. Complex applications with intricate design and unique solutions start at 1200+ hours of development. For a better understanding of the overall cost of development, you need to add research phrase, design, development itself, as well as testing and minimal maintenance period. The total cost of such an application is $31,500 with 1 week for designing and 13 weeks for development. A large application with a polished design, manipulation with media and activity feed, as well as all features described above would cost $68,400 with 7 weeks for design and 23.5 weeks for development. Want to save? Use the inquiry form below and learn if we can do better! When it comes to Android application, the discussion can carry on for months. There are several approaches, different technologies and frameworks, and neither solution can be universal. How to Choose Best Technology Stack? Some business owners find it extremely complicated to choose the tech stack for their Android applications. Here is a list of questions to help you reach the decision. Does your app have any specific requirements or considerations? You need to account for data usage, hardware access, platforms to cover (will it be Android application only), and much more. These aspects will help you narrow down the framework/language for your app. What’s the general objective and monetization points. For example, if you are offering subscription plans, access to features and design should be impeccable for users to be willing to pay for it, however, it the main profit comes from ads and in-app purchases, performance should be the main priority. What type of employment do you have in mind? Yes, this is also important as finding an expert for an in-house position can be challenging, but trusting a freelancer to have access to Java back-end might be problematic as well. Do you have any security restrictions? Modern apps, that have access to private data, should be able to withstand any attack and provide high-level security to the users. What are the compatibility requirements? If there is an existing project (website or back-end system) it is important to choose tech stack that will provide the best possible compatibility. Java is a 20+-year-old object-oriented programming language that still manages to stay among the leaders offering solutions within different areas of application. Native solution. As Android itself is built on Java, numerous libraries can be used for app development as well. Relatively fast building and performance. Despite being a primary language of Android, Java has several disadvantages. The extremely high cost of development (compensation rates are one of the highest in the industry). Less reuse of code, thus more errors and bugs. More memory use which results in slower performance. Making its first appearance in 2011, the first official release did not happen until February 2016. Let’s take a look at some interesting statistics to understand how things are going for Kotlin. Kotlin engages developers from diverse backgrounds. Despite being an obvious competitor of Java (specifically in terms of Android development), the study clearly shows that it is also often adopted by developers with JS, Python, and Swift in their arsenal. Along with an interest in new technology, its adoption has witnessed a significant rise from both experienced and junior developers/students. Like any other technology, Kotlin has its strengths and weaknesses. Let’s first discuss what makes Kotlin so great. So, within a great range of tools to choose from, what makes Kotlin so trendy and popular right now? Kotlin is an open-source, statically-typed language developed by JetBrains, meaning that IDE and tooling support is backed-up by a well–known company. Smooth integration with Java code. Despite being a major competitor, Kotlin can be integrated within the existing Java project and offers virtually seamless cooperation. It is extremely important for mature, enterprise-level products that were initially written in Java and won’t be changing the tech stack in any foreseeable future. Fixed null issue. For decades, Java developers struggled with crashes related to null variables. Kotlin solves this issue by offering null safety built in their type system. Now, your compiler will simply crash, highlighting the string with ‘null’ and making developers’ lives easier. Numerous smart extensions for building clean API’s. Cleaner and more concise code (better maintenance and fewer chances of errors), compared to Java. Except for learning and training, the adoption of Kotlin does not cost a thing. Small developing community, which, however, grows rather quickly. Nevertheless, some urgent issue will take time to solve as there are very few experts and support of a community is not that great so far. Senior (experienced) Kotlin developers are the rare breed, so finding a mentor might be a challenge. Certain performance issues in the compilation. If we compare pure Java project and Android Studio’s compilation, the second one will definitely be slower. Challenging learning curve. Due to its terse syntax, switching the whole team to Kotlin will take time. JetBrains report that around 20% of Kotlin developers work in companies with more than 5,000 employees, meaning that Kotlin is used to create some of the most famous applications. Among some of the highlights of the Kotlin-based applications are Pinterest, Uber, Evernote, and many more. What Is Xamarin? A cross-platform solution that allows developers to share around 90% of code across major platforms. The leader among countries that utilize Xamarin is the United States of America, owning around 47% share. Among the companies that have used or are currently using Xamarin are some well-known names like Trello, Slack, and GitHub. One tech stack to cover everything. Xamarin utilizes C# and .Net framework to create apps for any mobile platform. Close-to-native performance and user experience. The benchmark performance of Xamarin for Android can compete with similar apps in Java (as explained here), as well as provide UX which apes native application quite well. Full access to hardware. With Xamarin, your app gets native-level app access to the smartphone. Use of plugins and APIs allows Xamarin developer to avoid compatibility issues. Open-source technology with enterprise-level support After being purchased in 2016, Xamarin became open-source. Improved maintenance. Due to the cross-platform approach, support and updates of Xamarin apps are easier. Complete dev ecosystem. Having an IDE, the platform itself, testing, distribution, and analysis tools in one package is great! Smooth onboarding from Xamarin University. Having a dedicated portal for people who are willing to learn, makes Xamarin a great choice. What aspects should one consider before adopting Xamarin for their Android app development? Delays in support. Despite claiming to have same-day support, Xamarin has been spotted having delays in both support in updates. Restricted access to open source libraries. If you adopt Xamarin your choice of libraries will be limited to the platform components and some .Net open source resources. Xamarin community is rather small. There are approximately 1.4 million developers who use Xamarin. Required knowledge of a native language. At least a basic knowledge of native technologies either Java or Kotlin is required for Xamarin.Android. The larger overall size of an application. Typical Xamarin app is heavier than a similar native one. Compatibility issues. When it comes to the third-party libraries and tools, integration with Xamarin can be rather tough. In our blog, you can find information about Xamarin rates, as well as amuse yourself on the use of C# and .Net in Xamarin for both cross-platform and native development. If you are interested in Xamarin Android app development, you should consider outstaffing it to Ukraine. An open-source framework that was first officially released in 2005 by Nitobi Software, this Apache Cordova-based solution for hybrid applications. With the use of HTML, CSS, JS and PhoneGap Build, Android app can be easily built and deployed across multiple mobile platforms. According to the research, PhoneGap is adopted by over 12K companies within various business domains (including IT, recruitment, marketing, education, and healthcare). The United States have adopted PhoneGap the most. Hybrid solutions are winning the market over, but what makes PhoneGap appealing to both companies and developers? Uniformity of all applications. In the early days of mobile app development, it was virtually impossible to create Android and IOS apps that would look and behave in the same way. PhoneGap solves this issue by offering cross-platform development. Native-like behavior. When an app can access smartphone’s hardware, it can behave like a native application and provide users with better experience. Extra plugins and extensions. PhoneGap build supports both PhoneGap and Cordova plugins, to extend the functionality of the application ( PhoneGap developer can get them from Adobe repository, public git repository or npm. Nothing comes with a pretty side only, neither does PhoneGap. Issues with plugins that have hooks. If you use PhoneGap Build, Android app might have issues with certain plugins and their performance. Neither does PGBuilds support Cordova hooks. Not suitable for game dev. Some developers report freezing and crash in games, especially after notifications. Hardware needed. PhoneGap app developers need iOS SDKs, which won’t work without Mac. However, one can use PG Build to compile the build and return the final file. Outdated plugins. Some of the plugins have not been updated for a long period of time and might not have an alternative. Overall, PhoneGap is a good option when one requires both flexibility and functionality of an app. With certain manipulations on app using plugins, a native look and feel of an app can be achieved. Snowbuddy – an application for ski-lovers that allow you to ride up to the limit. Sworkit – allows its users to have video-guided workouts anywhere at any time! Tripcase – is an app that will guide you throughout every stage of your journey. HealthTap – allows you to get free and trustworthy advice from a doctor. Localeur – helps its users their favorite places to visit. Is Android Corona SDK Still Alive? For those of you who have never met Android Corona SDK, let us remind you that it is a free, cross-platform framework that has been around for almost 10 years. Initially written in Lua (scripting language), CoronaLabs claim that this framework has over 1000 built-in APIs, a great choice of plugins, as well as Corona Native extensions (C/C++/Obj-C/Java). Having a relatively small share of the market, only 0.43% of all apps Corona is mostly used for 2D games. As any cross-platform solution, Corona allows a developer to create one application for any platform with slight additions for platform-specific needs. Fast FPS. Compared to PhoneGap, the frames per second rate is better and can be easily adjusted for different screen resolutions. Faster emulator. Having a built-in emulator, Corona SDK allows refreshing the project every time a file is saved. IDE-Free. There is no dedicated Corona SDK IDE. You can use whatever environment you feel comfortable with, even if it is Sublime (by the way, Corona has some great plugins for Sublime). Great focus on design. Setting a background image or adding an audio file can be done with a few lines of code. With Corona, a talented designer is more important than an experienced developer. Numerous templates. Corona offers templates for games of any type available for purchase on their marketplace. Tutorials and examples of code that can be copy-pasted into an actual app. Tutorials cover all important topics, types of app and games, as well as provide recommendations for further reading. As any other solution out there, Corona SDK has its issues. Here are some things that one needs to be aware of. Use of Lua. Despite being relatively easy to learn, finding an expert in Lua is almost impossible. It takes time for a new team member to learn it, taking away the chance for rapid development. Expensive. The basic version is free, however, the Pro version, costs around $600 a year. Moreover, some plugins can cost $99 to $299 per year. Device testing is complicated. Despite having an emulator, its performance is limited in the basic version and some features cannot be tested in an emulator. Manual testing takes time (add build and deployment time to that as well), so the overall process can be frustrating. Performance-based vision. Ionic was created to improve the performance of applications that will run on it, making hybrid applications run faster and smoother, regardless of the device. Quick setup and Ionic View. Apart from an easy setup, there is this application that allows server preview before the big launch. Native-looking app. Ionic was initially created to mimic the behavior of the native mobile application. Decent framework + extensions. Since Ionic is built upon angular, every developer can find a number of features they will love. Okay, if Ionic is so lovable in terms of Android application development, what makes it so good? Well-balanced. With the proper focus on HTML, CSS and of course JS, Ionic allows reducing the cost of development of an app and minimal maintenance in the future. From-the-box option. Ionic offers plenty of UI component (such as buttons, toggles, inputs, lists, etc. ), saving the time if a basic application is needed. Extensions and plugins. With some extra plugins, one will be able to access smartphone itself, for example, a camera or fingerprint scanner. Fast overall development. Ionic is considered a relatively simple framework, as one does not need to know Java to make apps for Android. We would be lying if we said that Ionic use does not have any drawbacks. The primary concern for this technology is debugging, as with numerous third-party components it might be challenging to find where do the bugs come from, why builds fails, or what extensions conflict within each other. And, of course, one needs profound knowledge of JS&Angular for building complex solutions and intricate apps. When Should Ionic Framework Be Used? Typically Ionic is used to develop the various application for both internal use and for clients. Here is why Ionic app development is chosen by more companies every day. Lower costs of development. Being a hybrid solution, Ionic allows the deployment to multiple OS. It means that overall development costs will be reduced. Great UX. Ionic offers great user experience, making any application pleasing to the target audience, thus winning more hearts. With a growing number of brands that make Android-based devices, Ionic View comes to rescue making the testing process so much easier. Any Ionic developer will be able to achieve better results. Often, an Ionic framework developer is engaged in the process of development for both mobile OS. How an Android Developer Resume Look Like? Despite the common misconception, a good developer should have not only theoretical knowledge, but practical experience as well. This way, they will have valuable insight into how things work and what mistakes can be avoided in development. From everything we have discussed above, it is clear that outstaffing is the best choice for Android application development. If you have paid attention to the Rates section, you have probably noticed that Ukraine offers some of the lowest prices for Android development, while maintaining the high quality of services delivered. Needs. What a particular application should do in terms of your business? Understand the objective. How will this app help your business grow? Market research. Are there any competitors? What makes your application unique? Know the monetization mechanism. Only 6% of all apps in the Play Market are paid. How will you monetize yours? Target audience. What’s the geolocation of your target groups? What devices do they use? What is the best way to approach them? UI/UX Design. Does you your app require unique design? Hybrid or Native app (see section on Technology stack above). Transparent pricing policy. Upon your inquiry and discussion of the project demands, you will receive an offer with prices competitive even within the Ukrainian market. International experience in mobile app development. Mobilunity is proud to have a worldwide network of happy clients. Team composition to match the project requirements. Cooperating with Mobilunity, you can find a dedicated developer or create any team structure needed for your project. Top quality. Despite having moderate prices, we deliver only high-quality development teams, as well as provide a positive experience to our clients. Don’t waste your time looking further, hire the best Android developers now!